While running in the Marin Headlands last weekend it occurred to me that it had been at least a couple of months since I’d done a a run in Pt. Mugu State Park. 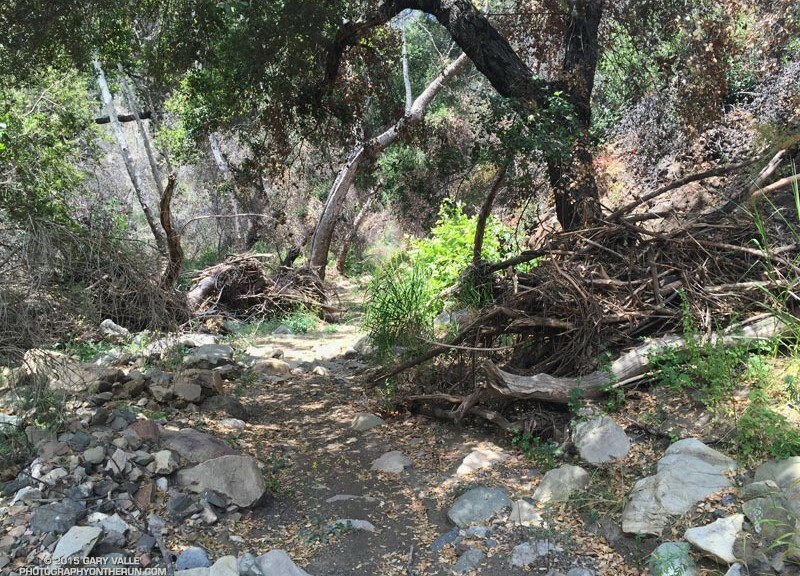 In addition to following the recovery of the area since the May 2013 Springs Fire, I’ve been surveying the effects of the December 2014 flash floods in Sycamore Canyon and its tributaries and hadn’t yet looked to see what happened in Serrano Canyon. When doing a run in Pt. Mugu State Park I almost always start at the Wendy Drive trailhead. I’ve run from that trailhead to Serrano Valley and Canyon a couple of ways. Both routes connect by way of Satwiwa and Danielson Road to the Old Boney Trail. One follows the Old Boney Trail all the way to the Serrano Valley/Canyon Trail. The other climbs up and over Boney Mountain, eventually connecting to the Backbone Trail, and then descends the Chamberlain Trail and rejoins the Old Boney Trail about a mile east of the Serrano Valley/Canyon Trail. Today’s run was a variation of option B. 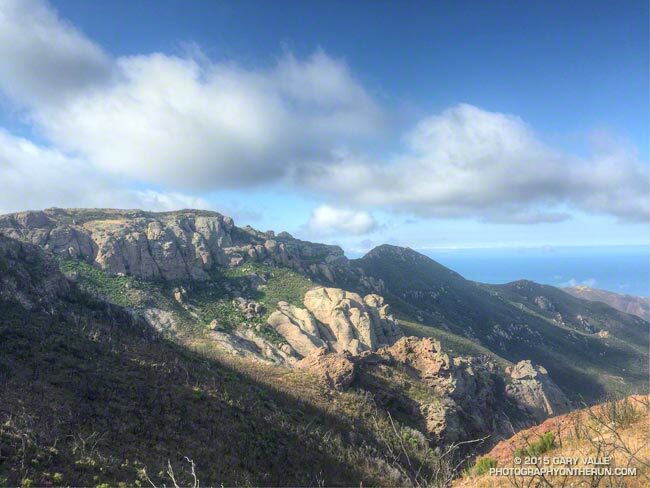 After climbing Boney Mountain to Tri Peaks, I ran over to Sandstone Peak using the Tri Peaks and Backbone Trails. Sycamore Canyon Fire Road, Two Foxes Trail and Upper Sycamore Trail were used to get back to Satwiwa and the Wendy Drive trailhead from Serrano Canyon. Poppies along the Two Foxes Trail in Pt. Mugu State Park. From Sunday’s run to Mugu Peak and back from the Wendy Drive trailhead in Newbury Park. 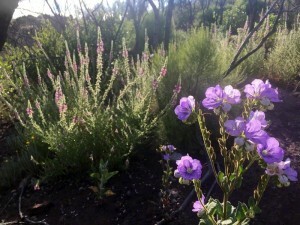 Following last year’s drought-induced hiatus goldfields are once again blooming in profusion on Lasky Mesa. 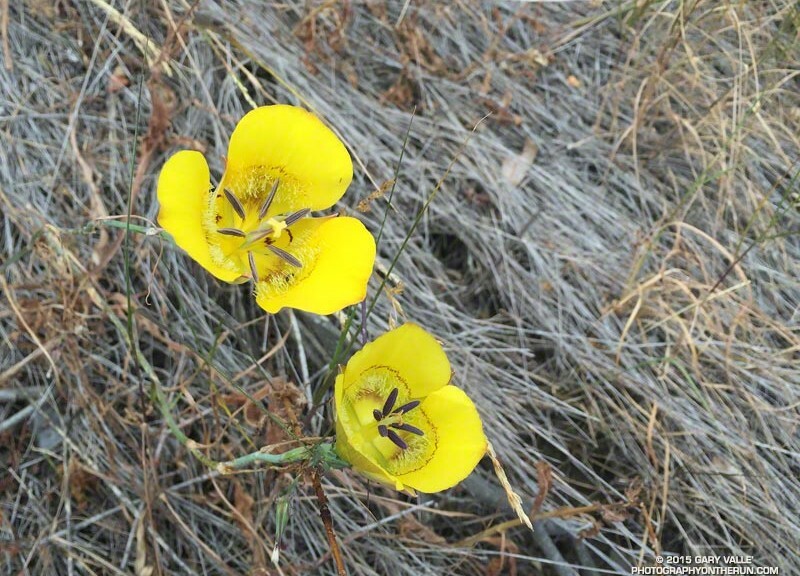 The little yellow “belly flowers” tend to grow in low spots and along paths where rain water pools. 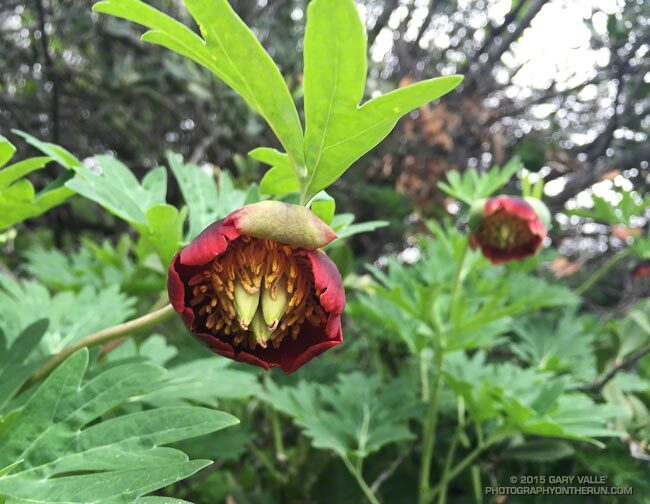 California peony (Paeonia californica) on an east-facing slope along the Garapito Trail in Topanga State Park. From Saturday’s trail run to Trippet Ranch from the End of Reseda (Marvin Braude Mulholland Gateway Park). I had to stop running and take it all in. 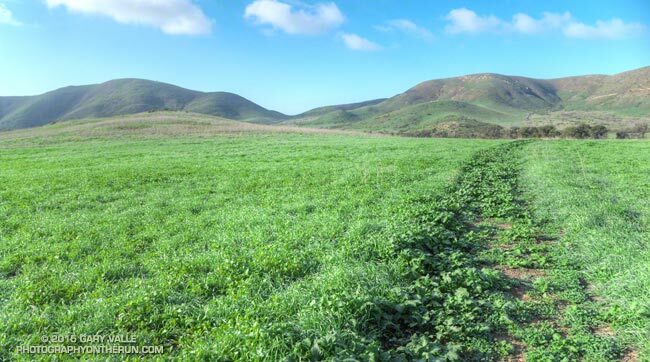 Soaked by recent rains, La Jolla Valley was renewed and green. To my right a meadowlark warbled its silvery call, and in the distance at first one and then another bird followed in song. Isolated for weeks by the closure of Pacific Coast Highway and Pt. Mugu State Park, the La Jolla Loop Trail was trackless and in places overgrown. Wet with dew, the mustard choking the trail had soaked my shoes and socks. Sprinkled among the greens were whites, purples, pinks, reds and yellows of the first stage of a wildflower explosion. A sweet scent drifted on the breeze. Running in the valley was like running in a remote and seldom-visited wilderness. There had been much to see on the run from Wendy Drive. Before the Park closed in December I had surveyed the aftermath of the December 12 flash floods in Sycamore Canyon, Blue Canyon and Upper Sycamore Canyon. One of the reasons for today’s run was to see what had happened in this part of the Park. Wood Canyon parallels Sycamore Canyon and is probably its largest tributary. Based on the height of the debris piled against the trees, the flash flood that roared down Wood Canyon must have been astounding! Looking down the stream course reminded me of flash floods I’d seen on creeks and streams during the El Nino’s of 1997-98 and 2004-2005. Bowl-shaped La Jolla Valley is an independent drainage, separate from Sycamore and Wood Canyons and their tributaries. It acts like a huge rain collector and funnels all the runoff down deeply cut La Jolla Canyon to the ocean. In La Jolla Valley all the creeks were scoured by the flash flooding and the small footbridge west of the group campground was washed out. The vernal stock pool on the Loop Trail above La Jolla Canyon was once again full. It’s no surprise that the December flash floods washed out the trail in La Jolla Canyon. I can’t think of a steeper and more narrow canyon in the park. The flow must have been phenomenal! 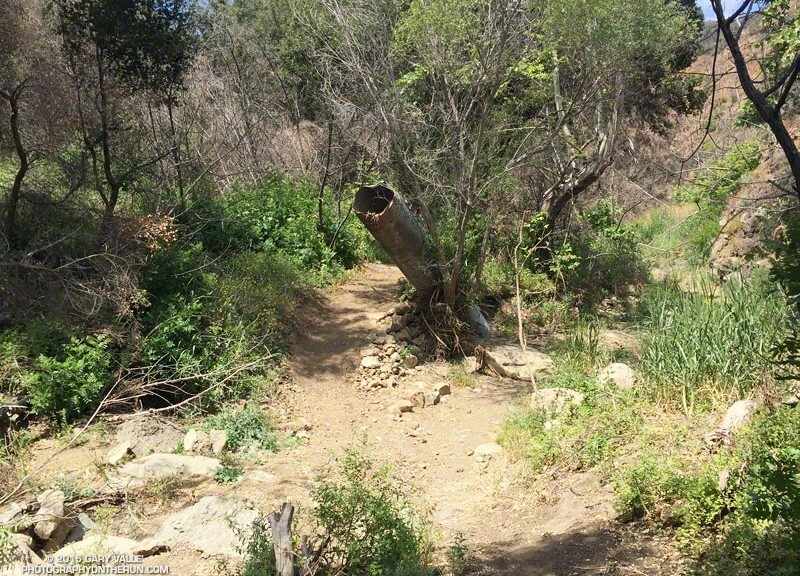 The La Jolla Canyon Trail is closed and barricaded at its juncture with the Loop Trail. Here is a trail map of the area from the La Jolla Valley Natural Preserve web site. 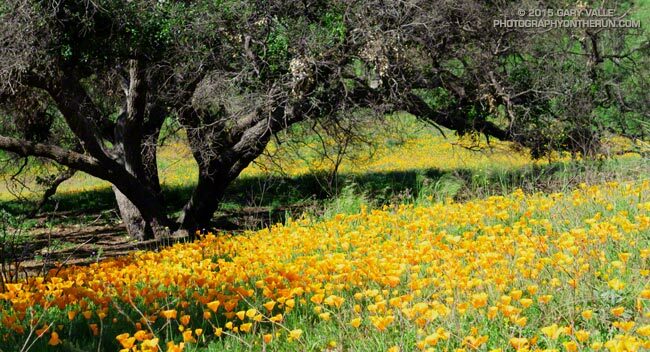 In recent years the drought has dramatically reduced the number and variety of wildflowers blooming in the Santa Monica Mountains. Not so this year. Since October 1 Camarillo Airport has recorded 7.0 inches of rain, which is about 92% of normal. Last year over the same period only 0.84 inch had been recorded. 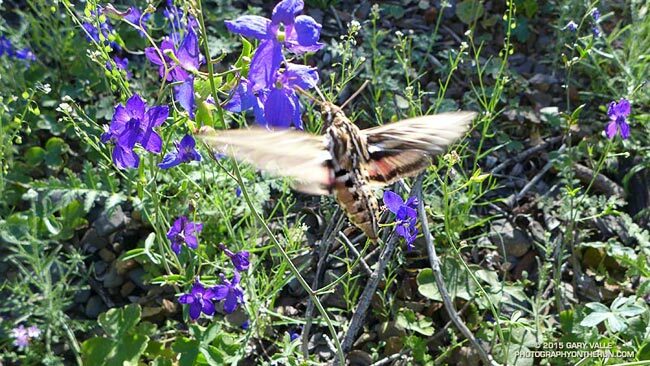 Many species are already blooming and many more will be blooming soon. 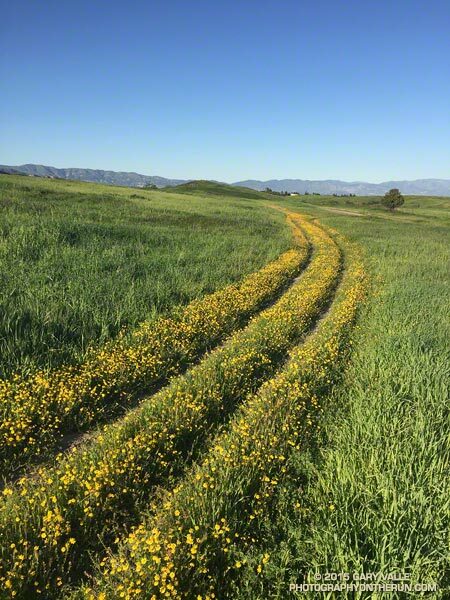 On today’s run I saw shooting stars, encelia, lupine, nightshade, monkeyflower, paintbrush, California poppy, bladder pod, wild hyacinth, phacelia, wishbone bush and more. 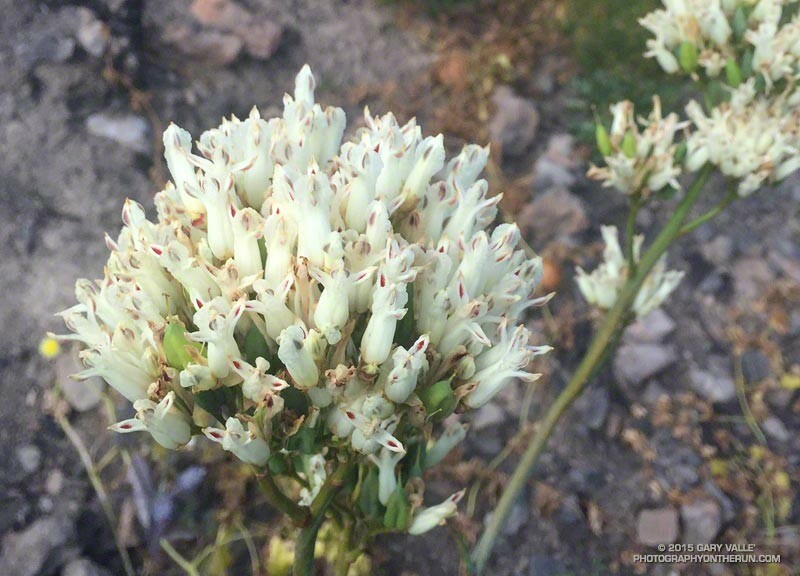 A small patch of chocolate lilies were in bloom along the eastern segment of the Loop Trail. La Jolla Valley and Mugu Peak can be busy places, but today it was just me and the meadowlarks. Update February 3, 2015. 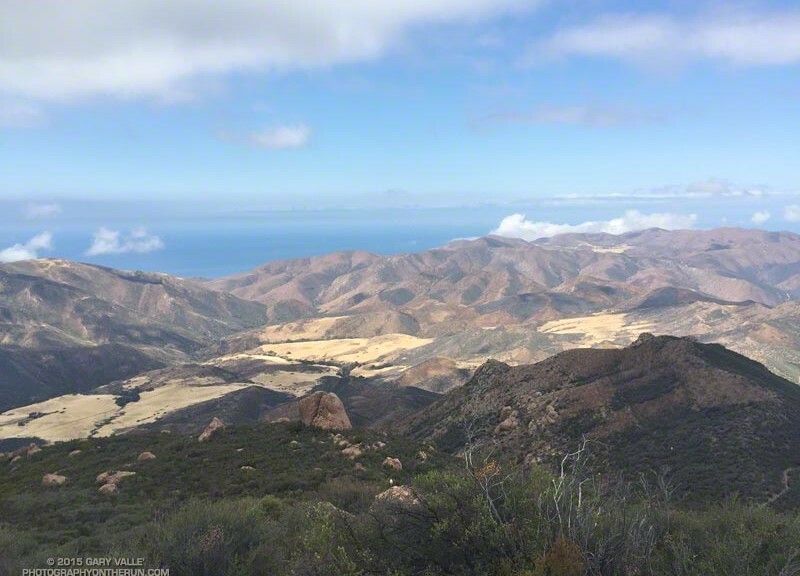 According to the Ventura Star six miles of Pacific Coast Highway from Las Posas Road to the Sycamore Cove Day-use Area reopened today providing access to Pt. Mugu State Park from the south. Note that the La Jolla Canyon Trail is still closed and likely to be for some time.